This game is a sort of solitaire games playing with tarot cards. 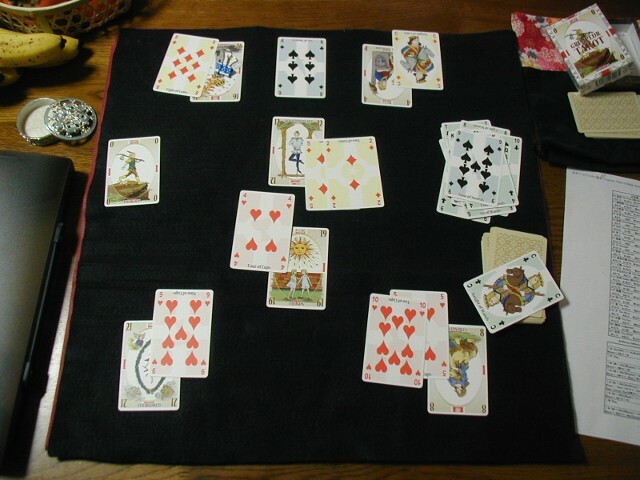 At first of the game, you spread 6 cards of shuffled 22(-2) major arcana as a game board and place freely a token on one of the 6 cards as a mark of the player. The game proceeds by drawing a card from shuffled talon of 56 minor arcana + 1 terminal major arcana which decide the token to move or not. At the end of the game, win depends on the place of the token. A drawn card and the place of the token decide which direction the token should move. Calculation with the number table of major arcana decides wheter the token can move or not. That is somewhat complex but you will become used to play this game with tarot cards and the number table. At this time, I made this game into a browser game, in order for everyone to feel rules. In the browser game, after you place the token, you are only prompted to draw a card from the talon and sometimes to choose "move" or "stay". Once you play through the game to "win" or "loose", you will come to know what kind of game this is. The opening of idea stood a brick wall of my study of mathematical theory of games. I was suffered to devise a game model (maybe complex) which reflects an aspect of society. At that time, my video game machine playing tarot accidentally became out of order. Hesitantly, I read explanations of tarot in WWW to play tarot manually. I recollected arguments of Yi-King divination lore, and thought how to make a Yi-King divination with tarot. Then, this game naturally consisted. So, this game doesn't have its special history, and it must be me who designed this game by consulting Yi-King, Tarot, Sogoroku, games like "Magic: The Gathering" and etc. The name of this game comes from Yi-King (=易) and Sugoroku (=双六, a genre of Japanese board games). In Japanese, "易双六" can be pronounced as "Ekisugoroku" and this can get corrupted to "Yosuko" which means Yangtze Chinese River (=揚子江). In English, Japanese "Yosuko" doesn't sound Japanese alike. I decide the name to be "Youscout" for more English than it. Detailed rules are here. The number table of major arcana can be got below. In usual games, the doubled number table is used, but I put the original ×1 number table below, too. The author is JRF ( http://jrf.cocolog-nifty.com/ ). I intended this browser game to be public-domain, but you may treat it as such under the BSD Licence, except for the JRF Tarot. (The JRF Tarot is not included in the archives, but is archived as another one). I admit that my skill of illustrations doesn't reach payable level, but, expecting improvement, I will reserve commercial rights of the pictures of the JRF Tarot. I don't need royalty for selling software or introductory articles with parts of them. Please contact me, however, if you go mad to want to sell printed cards of the JRF Tarot commercially. ...And NOW (2013-02-21), I am also distributing Nintendo DS's version of "Youscout"! Youscout being played by the author.